We’d love your help. Let us know what’s wrong with this preview of Axle Annie by Robin Pulver. School bus driver Axle Annie is so good at getting her bus up Burskyville's snowiest hill that the schools never get a snow day -- and that's why evil driver Shifty Rhodes plots to stop Axle Annie in her tracks! To ask other readers questions about Axle Annie, please sign up. 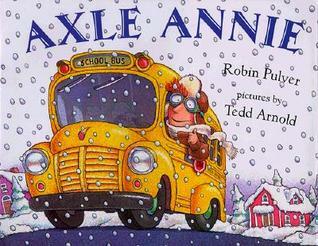 "Axle Annie" was an overwhelming read-aloud hit with a class of second graders in my elementary school library. Tedd Arnold's comical illustrations are the perfect complement to Robin Pulver's tall tale about a dedicated school bus driver who can always make it up Tiger Hill, no matter how snowy it may get. When the superintendent asks her on blizzard mornings if she can make it up Tiger Hill, Axle Annie always replies, "Do snowplows plow? Do tow trucks tow? Are school buses yellow? 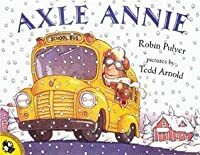 Of course I c "Axle Annie" was an overwhelming read-aloud hit with a class of second graders in my elementary school library. Tedd Arnold's comical illustrations are the perfect complement to Robin Pulver's tall tale about a dedicated school bus driver who can always make it up Tiger Hill, no matter how snowy it may get. When the superintendent asks her on blizzard mornings if she can make it up Tiger Hill, Axle Annie always replies, "Do snowplows plow? Do tow trucks tow? Are school buses yellow? Of course I can make it up Tiger Hill!" This is how he always determines that Burskeyville Schools will stay open in stormy weather. Another bus driver, Shifty Rhodes, who hates to drive in blizzard conditions, teams up with disgruntled ski resort operator, Hale Snow, who never has extra business because local schools never close for snow days. Together they come up with a plan to prevent Axle Annie from making it up Tiger Hill. In our elementary school, where a majority of the students ride the school bus, and where we sometimes DO close for snow days, the kids could relate to the exaggerated personalities of the drivers, as well as the snowy conditions that every child--and some teachers--hope will shut down school once in a while. Around here, many kids probably would probably go skiing, sledding or snowboarding. >how are these "the luckiest kids" if they never get a snow day? >why are the adults going out on such a day? >Do these parents not care about their kids being out in that weather? >How does the superintendent think that the teachers and support staff are going to get to work? >Why go out in that snow even if one bus driver claims to be able to drive in it? >How is a clunky school bus able to make it through when other cars are not? >Why are the roads not being plowed? >Seriously?!? Why not just have a snow day?!? I enjoyed reading this book in my practicum class. The students really enjoy reading this book because it becomes predictable and they are able to read aloud with the teacher. I saw this book used to discuss protagonists and antagonists, especially kindness and helping others. I was amused that a few days after we returned from our vacation at Disney World that my nephew would choose a book that's about snow! Axle Annie is beloved by all of the town as she's not afraid to go out during a snowstorm, no matter how blizzard-y it is, to get kids, and stranded motorists, and take them to school (or work!). When one of the school's grumpiest bus drivers meets the local ski resort owner whose business isn't doing so great, the two hatch a plan to stop Annie in her tracks, and I was amused that a few days after we returned from our vacation at Disney World that my nephew would choose a book that's about snow! When one of the school's grumpiest bus drivers meets the local ski resort owner whose business isn't doing so great, the two hatch a plan to stop Annie in her tracks, and give the town a much needed sow day! I was amused by this story of an unbeatable bus driver, who always makes it up the steepest hills in the worst weather, and the grumpy colleague who partners with a ski resort owner to try and defeat her, because her skill means that school *never* closes for snow. She's a great heroine even though I have my doubts about the practicality of her daredevil driving! However, I have to admit that my firstgrader, who does ride a bus, had no interest in this book. Ok - there will be several books that I'll be reading now thanks to my kids goals in school. But, this book (and the other in the series) is truly adorable. I love the illustrations. But, the story is really great. If I can just keep finding books like this to help encourage my kids to reaching their reading goals - we will both be happy. Cute story about a school bus driver who was always ready to face the huge hill on her bus route even when a blizzard came, despite some trickery by some other drivers who always want school to shut down. My kids always love Tedd Arnold's fun illustrations. axle annie is about a bus driver named axle annie who could ALWAYS get up the steepest hill of all...tiger hill!but grump a grumpy bus driver wanted to stop her.i learned that to never have hatred on someone for someday you will be sorry.! 2009- Not sure the preschoolers I read this too actually ""got"" it. Super cute and what a treat to read a children's book where the author and illustrator understand kids. Two Thumbs up! With Axel Annie, school never needs to be closed even on the snowiest days because she will make it. Students are happy to have her as a bus driver. This story was quite a pleasure to read and the illustrations quite well done. The way it is written lends itself very nicely to reading out loud to the kiddos. Tedd Arnold's illustrations add to this humorous story about a bus driver who can drive in any snow storm. Fun to read, fun to discuss with the kids. Appropriate level of villains plus suspense. Fun little story about a bus driver making it through the snow. Great illustrations by Tedd Arnold. Very cute -- great for little kids as it has several repeating lines throughout. 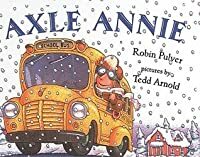 Ok story--I'm not sure students will connect with main character of Axle Annie, the bus driver who never allows school to be cancelled due to snow.